The GLE crossover coupe is expected to be available late next year as a 2016 model and be offered with rear- and all-wheel drive. 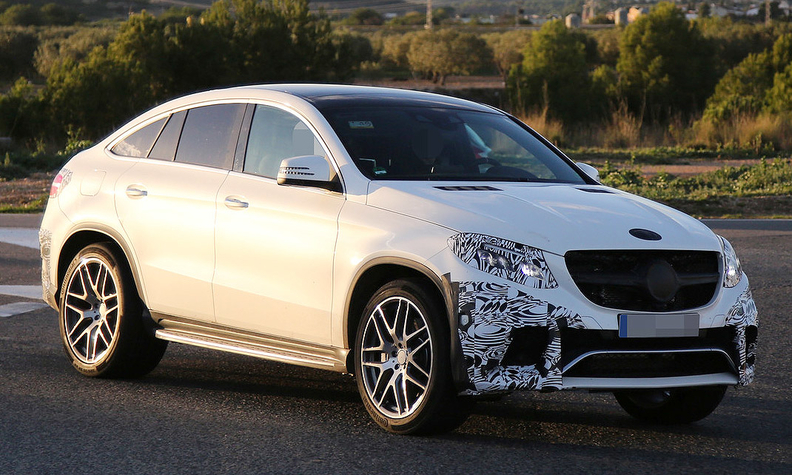 Here are the clearest photos yet of the Mercedes-Benz GLE Coupe, a tall wagon/sedan with swoopy coupelike styling. The GLE Coupe will be built in Daimler’s U.S. plant in Alabama and will be sold alongside the current M-class SUV, which is due for a facelift and a name change next year. The M class will also get the GLE name next year as part of an overhaul of Mercedes Benz’s naming system. The GLE Coupe is expected to be available late next year as a 2016 model and be offered with rear- and all-wheel drive. It will compete with BMW’s tall wagon, the X6, a chunky crossover that spawned several imitators, such as Honda’s Crosstour and the Acura ZDX, which was dropped in 2013 after only two years. The crossover coupe’s front styling is reminiscent of the Mercedes-Benz SLK, with the same shaped grille and pair of power bulges on the hood. No word yet on prices and powertrains.